One of the key items in every amateur astronomer's kit (professionals, too!) is a red lens flashlight. It is a fact that our eye's dark adaptation is less affected by red light than by any other color and if you are going to see stars at night, your eyes need to be fully dark adapted. Other outdoorsmen, such as campers and hunters, face a similar problem at night. The advent of red LED flashlights has made the old red flashlight lens (often homemade from a #25A photographic filter, red cellophane or something similar) obsolete. LED flashlights have sparked a revolution in hand portable lighting and nowhere is this more evident than in LED lights with multiple color LED's, usually red and white or red, blue and white. A selector switch lets you choose the color of the LED and thus the color of the light. Recently, in the course of reviewing a number of modern, high tech flashlights, we were particularly impressed by LED Lenser lights. LED Lenser is a product and brand of Zweibrueder Optoelectronics, Solingen, Germany, although the lights reviewed here were actually manufactured in Red China. When we conceived the notion of reviewing a couple of red LED flashlights, we first thought of the LED Lenser brand. Our friends at Coast Products in Portland, Oregon, USA are the exclusive importers of LED Lenser lights for both North and South America. They kindly supplied the flashlights that are the subject of this review. LED Lenser flashlights are the brightest lights on the market. This is achieved by LED Lenser patented reflector systems, top quality LED's, and Power Transformation Technology that uses a microprocessor to digitally increase the voltage supplied to the LED and regulate the current at the same time. The electrical contacts are 24-karat gold plated. The three main components (light head, main tube and tailpiece) of LED Lenser flashlights are machined from heavy-duty aluminum and O-ring sealed at both bezel and tail piece for protection against the entry of dust and moisture. The main body of the tube is checkered in a fine, flat-topped pattern for a secure grip. The LED Lenser flashlights provided for this review include the Model 7736D Dual Color Tactical flashlight, Model 1106 Dual Color General Use flashlight and the Model 1065 Dual Color Headlamp. In each, the "dual color" designation refers to the presence of a red LED and multiple white LED's in the light's reflector. In each light, the red LED is in the center of the V2 six-chip reflector, surrounded by a circular array (cloverleaf) of five white LED's. These LED's are extremely durable and will provide up to 100,000 hours of light without replacement. LED Lenser #7736D Tactical Light. Illustration courtesy of Coast Cutlery. 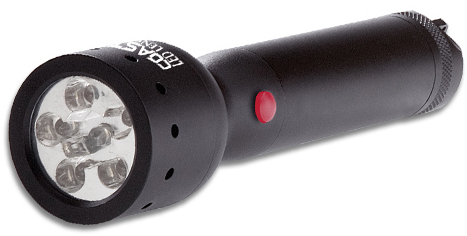 The Model 7736D Tactical light is both smaller and brighter than the Model 1106. Its five white LED's can pump out 100 lumens for up to 50 hours. That is a lot of light from a body only 3.75 inches long. It is cylindrical in shape and one-inch in diameter; there is no flare to the bezel. Like all of the LED Lenser lights we have reviewed, it is built like a tank with a body machined from heavy-duty aluminum and sealed against the intrusion of moisture. The body of the case is extensively checkered in a very fine, flat-topped pattern. The Model 7736D is supplied with a nylon pouch case with a belt loop, wrist strap and a small snap shackle. It runs on three AAA batteries (supplied), which are installed from the front by unscrewing the bezel. The 2009 online retail price is $40. There are two on/off push buttons, located on opposite sides of the flashlight body behind the bezel. One is black and matches the body color of the flashlight (for the five white LED's) and one is red (for the single red LED). Either button can be used singly, or both the red and white LED's can be turned on together. This simple, easily understood system eliminates the confusion of a multi-function switch. The only drawback to the dual on/off, color-coded button system is that in the field on a dark night, the buttons must be operated by touch, which means that the color-coding cannot be seen. There is then the possibility of accidentally switching-on the white light instead of the red light. This will not win many friends at a star party! The black (white light) button is very lightly checkered to create a tactile difference, but the checkering is so shallow that it is difficult to feel. Our suggestion is to make the checkering deeper and sharper for easier recognition. As it stands now, we found that scratching the top of the buttons with a fingernail was the easiest way to tell the checkered black button from the smooth red button in the dark. LED Lenser #1106 flashlight. Illustration courtesy of Coast Cutlery. The Model 1106 General Use flashlight, although not actually large, is the biggest of the three lights we tested. It is a medium-small light with a heavy duty, black anodized, machined aluminum case that is 6.25" long and about 1.4" in bezel diameter. It is smaller than a conventional two C-cell flashlight. The case body is extensively covered by fine, flat-topped checkering for a secure grip. The Model 1106 runs on a cluster of three AAA batteries. They provide up to 118 hours of run time, which is about ten times the run time of a light with a conventional incandescent bulb. The maximum light output is 62 lumens, or around twice the brightness of a typical two C-cell flashlight with a halogen bulb. The 2009 online retail price is about $30. As with the Model 7736D, there are two on/off buttons on opposite sides of the lights body, one red (for the red LED) and one black (for the five white LED's in the V2 reflector). The comments in the 7736D section (above) about tactile identification of the buttons when it is dark apply equally to the 1106. The Model 1106 is a neat flashlight, slender enough to be slipped into a hip or jacket pocket and large enough not to be easily misplaced. Its white light output is plenty bright enough to allow setting-up a telescope or a camp site at night and its red light, while more than adequately bright, is not as damaging to night vision as the Model 7736D. LED Lenser 1065 Headlamp. Illustration courtesy of Coast Cutlery. The Model 1065 Headlamp positions a 22 Lumen light head incorporating five white LED's and one red LED in a silver metal bezel on an elastic, adjustable headband. The plastic light head upon which the bezel is mounted is hinged at the bottom so that the direction of the light can be adjusted straight ahead or pointed down at any angle desired for map reading or other close work at night. A separate battery pack at the rear of the headband holds the three AAA-cells that power the unit and incorporates a rheostat to reduce the light output, an excellent feature. The package includes a small Neoprene carry pouch. The 2009 online retail price is about $40. Six high-intensity LED's (one red and five white) are mounted in the same sort of cloverleaf reflector system used in the LED Lenser flashlights reviewed above. The three AAA alkaline batteries provide up to 115 hours of light, thanks to the high output LED's, which are some 10 times more energy efficient than conventional headlamps. The bright white light is visible for 2000 yards with the dimmer set to full output, while the red LED preserves nighttime dark adaptation, especially with the dimmer turned all the way down. 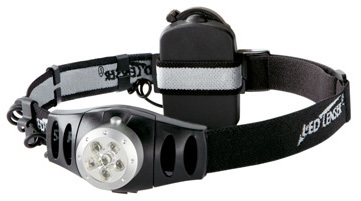 The Model 1065 Headlamp is comfortable to wear and very convenient to use. As worn normally, the button for the white LED's is on top of the bezel and the button for the red LED is on the bottom. None of us on the chuckhawks.com staff is accustomed to wearing a headband, but we all easily accommodated to the Model 1065. We field tested the three LED Lenser Dual Color lights at an Astronomy and Photography Information Guide star party at a dark sky site in the foothills of Oregon's Cascade Mountains. Once we had parked the vehicles, set-up the telescopes and shut down the lights, it was very dark! At a telescope star party, once the white lights have been shut off to allow the participants' eyes to become dark adapted, no further use of white light is allowed. Only red light flashlights are permitted, in order to preserve night vision. It takes about 45 minutes for human eyes to become fully dark adapted, so switching-on a bright white light that destroys this patiently awaited night vision elicits a chorus of groans. Spend a whole night out in the hills under the stars, in this case with no moon, and your red flashlight gets a lot of use. Visual astronomers are constantly adjusting mounts or slow motion controls, aligning their telescopes on new objects, changing eyepieces, reading star maps, jotting notes in their journals, trying to find where they set their eyeglasses, or their water bottle, or the thermos of hot coffee and so forth. All of this is done by (hopefully) dim red light. We hooked the Model 7736D's wrist strap to the supplied snap shackle and clipped the shackle to the belt loop on the case. This allowed us to hang the case, with flashlight inside, from one of our telescope's knobs using the wrist strap, easy to locate in the dark and ready for use. In use, the 7736D worked great, but as mentioned above its red LED is really too bright. As a temporary expedient, we toned it down a bit by blackening the top of the red LED with a Sharpie marker. We will find a more permanent solution before the next star party. The 7736D's small size makes it very convenient to use, or to drop in a shirt pocket when not in use. At the end of our star party, its very bright white light was useful when putting away the telescopes. The LED Lenser patented V2 cloverleaf LED arrangement creates a bright center spot with a dim, but wide, surround. At the end of the night, Managing Editor Chuck Hawks slipped the 7736D into his telescope kit and it has not been seen since. Although not a big flashlight, the Model 1106 is larger than the Model 7736D. This worked somewhat to its advantage, as it is harder to misplace in the dark, yet the handle will still fit in a pants pocket, or a jacket pocket. Overall, it did a fine job. Its five white LED's provided plenty of light for setting-op and breaking-down the telescopes. The illumination pattern is similar to that of the Model 7736D, as it uses the same V2 cloverleaf LED configuration. The Model 1106's red LED is not quite as bright as the Model 7736, which is good. Staff member and telescope owner Bob Fleck glommed onto the Model 1106 and used it all night. He was very pleased with its performance. In fact, he refuses to give it back, so we guess it has found a home. The Model 1065 Headlamp is the most convenient sort of nighttime light for the amateur astronomer. It puts the red light exactly where needed for reading star maps, adjusting a telescope mount, changing oculars, writing notes, etc. and leaves both hands free to accomplish these tasks. With the dimmer turned all the way down, it was still adequately bright. We wish that the hand held flashlights had dimmers! While taking apart the telescopes at the end of the night, the Headlamp's rheostat was turned up and the white LED's came into play. Although not as bright as the LED Lenser hand held flashlights, they provided more than adequate illumination. Staff members Rocky Hays, Gordon Landers and Chuck Hawks all made good use of the headlamp. They will not be attending future star parties without one. Copyright 2009 by chuckhawks.com. All rights reserved.